Truck Window Tinting, Winston-Salem, NC | Innovative Solar Control Inc. Truck Window Tinting, Winston-Salem, NC | Innovative Solar Control Inc.
Truck window tinting provides greater comfort in your vehicle year-round. Whether you have an everyday pickup truck, drive a heavy-duty vehicle for work, or operate a commercial vehicle for long hauls, knowing that you can remain comfortable on the road is an important part of the drive. While you may find that your visor provides some relief from the sun, it isn’t always the most efficient method for maintaining good visibility and safety. At Innovative Solar Control Inc., we have a great solution for drivers of any kind by providing truck window tinting that will not only offer protection against the sun, but also greater comfort in your vehicle year-round. Truck window tinting makes your vehicle warmer in the winter and cooler in the summer and offers 99% protection against UV rays. It also protects the interior surfaces of your vehicle so that they maintain their color over time. Using our Roland CAMM 1 Pro window film plotter, we can accurately measure your windows for truck window tinting specific to your vehicle. 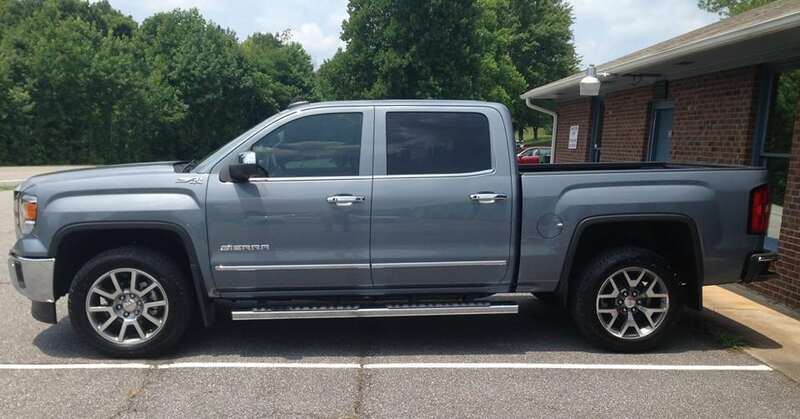 We make sure to install truck window tinting with a precise fit, and you’ll notice the difference right away when you hop in the cab to take a drive in Winston-Salem, North Carolina. At Innovative Solar Control Inc., we also offer an excellent limited-lifetime warranty against bubbling, distortion, delamination, and peeling – which means you’ll get lasting results from truck window tinting done by us. If you have questions about the benefits of truck window tinting or want to schedule an appointment, contact us at Innovative Solar Control Inc. today to get started. At Innovative Solar Control Inc., we offer truck window tinting services in Winston-Salem, Clemmons, Mocksville, Lewisville, Advance, Lexington, Bermuda Run, Muddy Creek, Wood Lee, and West Bend, North Carolina.